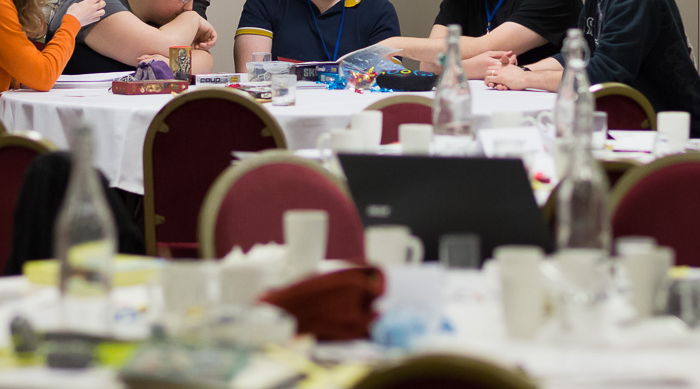 Last Sunday saw the anniversary of the birth of Martin Gardner, and as a celebration, the Gathering for Gardner people planned a world-wide party ‘G4G Celebration of Mind‘. It happened to be Maths Jam night on Tuesday, so we put the Nottingham Maths Jam on the G4G-COM map. Then on Friday three of us had agreed to take a puzzles stall to the Nottingham STEM Pop Up Shop, so I added this to the map as well. A Celebration of Mind party is supposed to “celebrate the legacy of Martin Gardner on or around Sunday, October 21, 2012 through the enjoyment of [one or more of] Puzzles, Magic, Recreational Math, Lewis Carroll, Skepticism and Rationality”. 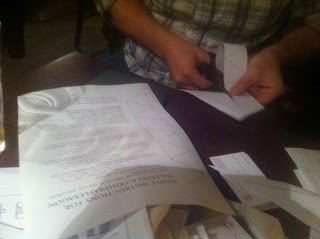 At Maths Jam I printed a bunch of flexagon material from the Flexagon Party page. I also had a plan: having finished two jobs in recent years with piles of business cards outstanding, I brought these to try some business card origami. In fact, we decided to make a business card Menger sponge. So we started folding. 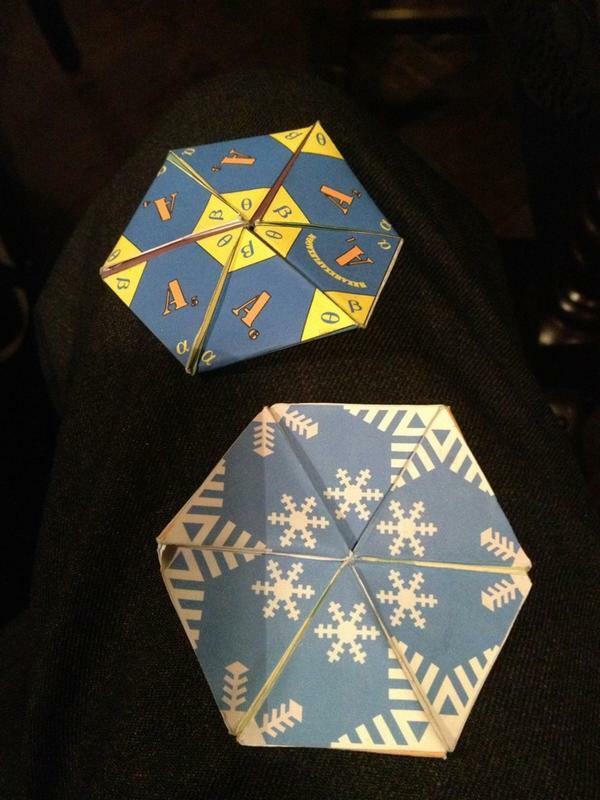 Meanwhile, John Read had come equipped with some colourful designs to make hexahexaflexagons. 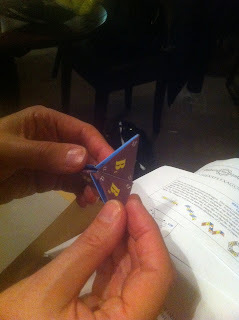 John Read’s first hexahexaflexagon of the evening. Designs from flexagon.net. John Read’s second hexahexaflexagon. Designs from flexagon.net. At the same time, Jon made a trihexagon. 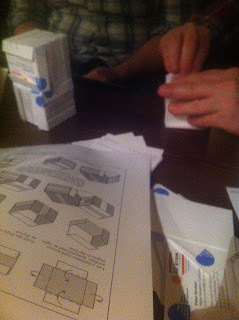 Finally, after much business card folding,we had a Menger sponge* (*not a real one, it being a fractal after all!). 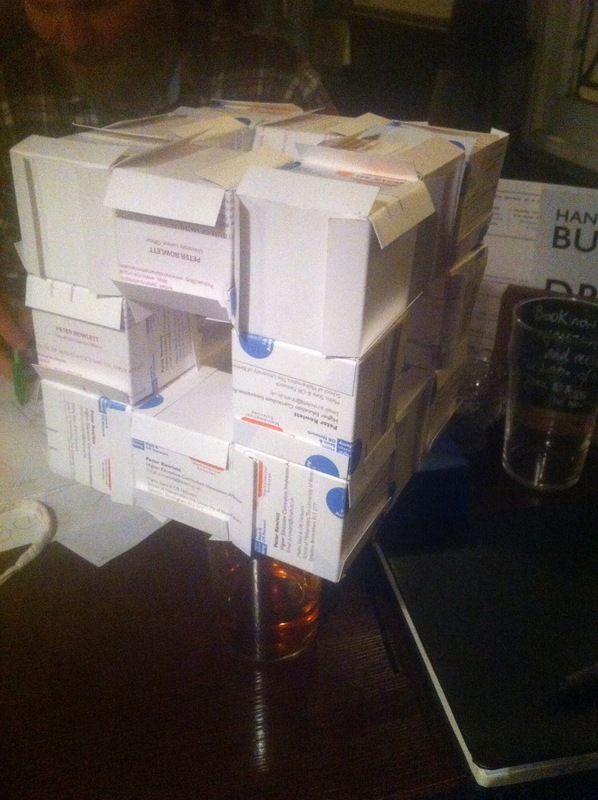 Here it is, in Maths Jam-style, balanced on a pint of beer. 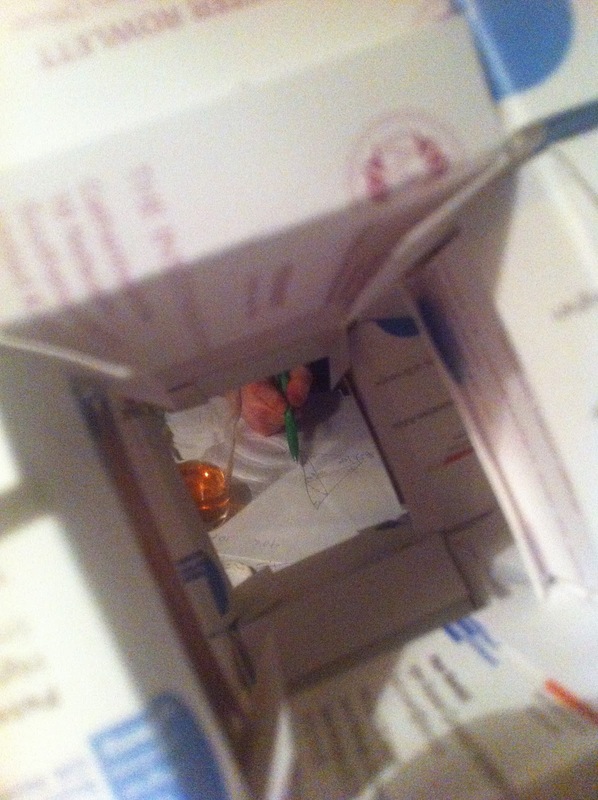 And here’s a shot through the Menger sponge, where a geometry puzzle is being attempted. You have 100 coins, 10 of which are showing heads and 90 of which are showing tails (though these are indistinguishable by touch). Blindfolded, you must divide the coins into an even number of heads and tails. Which is bigger, 3^(21!) or 2^(31!)? Then on Friday we made our way to Broadmarsh shopping centre for our afternoon at Nottingham’s STEM Pop Up Shop. Here’s a picture of our stall, with Kathryn Taylor presiding, and in the foreground the posters about Martin Gardner, mathematical games and mathematicians that I had printed. Someone did ask me who Martin was and I explained a little; I think I also convinced him to come to Robin Wilson’s talk on Lewis Carroll next month in Derby. Here’s the detail of our stall, which we called ‘Solving it like a mathematician’. You can get details of the set of puzzles on my website. Looking around the shop, I requisitioned the Alan Turing postcards from the ‘My Favourite Scientist’ set for our stall! Here’s a wider view of the stall, with Kathryn entertaining a customer. And finally, here’s John Read bewitching a crowd with the loop on a chain trick. 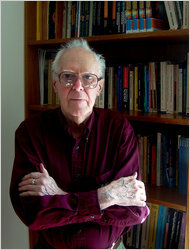 This Sunday, 21st October 2012, marks what would have been the 98th birthday of Martin Gardner, American man of letters and numbers, as well as logic, puzzles, magic and scepticism. I had the good fortune to know Martin in the last decade of his life, and a more gentle and modest man you could not find, completely disproportionate to the forceful and wide influence he wielded for over 50 years as a science and mathematics journalist of the highest calibre. The first time I met Martin he fooled me by showing me a tall thin glass and getting me to agree that its height exceeded its circumference, when in fact it didn’t. A new episode of the Math/Maths Podcast has been released. A conversation about mathematics between the UK and USA from Pulse-Project.org. First Samuel and Peter were joined by special guest Edmund Harriss to talk about his time at Gathering for Gardner 10 and Five math things to do before you die, then they spoke with eachother about: Snowflake Growth Successfully Modeled from Physical Laws; A Joint Position Statement of the Mathematical Association of America and the National Council of Teachers of Mathematics on Teaching Calculus; All the Math Taught at University Can Be Outsourced. What Now? ; Mathematical Fonts; Intersections, Henry Moore and British modernism exhibition; Emmy Noether: The Mighty Mathematician You’ve Never Heard Of; Rechner Calculator; Math Awareness Month: Mathematics, Statistics, and the Data Deluge; and much more. You may be aware that Gathering for Gardner 10 took place last week.